So, you've made your resort reservations and booked your flights. Now, how will you get from the airport to your resort? Thankfully, Disney has thought about that and offers their own transportation called Magical Express. Do we recommend Magical Express? Magical Express is a service that operates 24/7 and provides free bus transportation between Orlando International Airport and Disney World resorts (not including the Swan, Dolphin or Shades of Green). The service will also transport your luggage so you don't have to, but you can choose to transport your own luggage if you'd like. Sign up for service. When you book your trip, you can specify that you want to use Magical Express and input your flight info if you have it. If you don't specify this info when you book, you can go to DisneyMagicalExpress.com to sign up, at least 10 days before your trip begins (preferably much earlier - weeks in advance if you can). Get luggage tags and vouchers by mail. If you live in the U.S. or Canada*, you will receive vouchers and luggage tags a couple of weeks before your trip that will need to go on each piece of luggage that you want them to retrieve from the baggage carousel and take to your resort (you'll receive 1 tag per person but if you need more than that, call 866-599-0951 to let them know you need more). If you want to get your own bags and carry them to the bus, you won't need to use the luggage tags. People who arrive after 10 p.m. must retrieve their own luggage and will not be able to use the luggage delivery service. Didn't get the tags in the mail or forget to put them on your bags? As long as you arrive in Orlando between 5:00 a.m. and 10:00 p.m., you can provide your baggage claim numbers upon arrival at Magical Express, and they’ll get your bags for you. * People outside of the U.S. and Canada will not receive vouchers and luggage tags in the mail, but can still use Magical Express. These people will find it easier to retrieve their own bags at baggage claim at the airport after clearing customs, but you can talk to the employees at the airport desk if you'd like your luggage picked up and they will be able to help you. Good packing tip: spread items from each member of the travel group among all of the bags. That way if a bag is lost, 1 person isn't at a total loss. That applies any time you fly, but with the added step of being handled by Disney, it's even more important. Anybody who encounters any issues, including lost bags, should call them at (866) 599-0951. Your MagicBand and the vouchers that come in the mail with your luggage tags function as your tickets to board a bus, but if you don't have your vouchers or MagicBands when you arrive at the airport, you can go to the Magical Express desk and they'll help you out. On the return trip back to the airport, you won't be able to use your MagicBand but will need your vouchers instead. Your departure documents will be delivered to your hotel room the day before you depart. If you don't receive them or if you lose them, visit the front desk at your resort and they will be able to provide you with them. 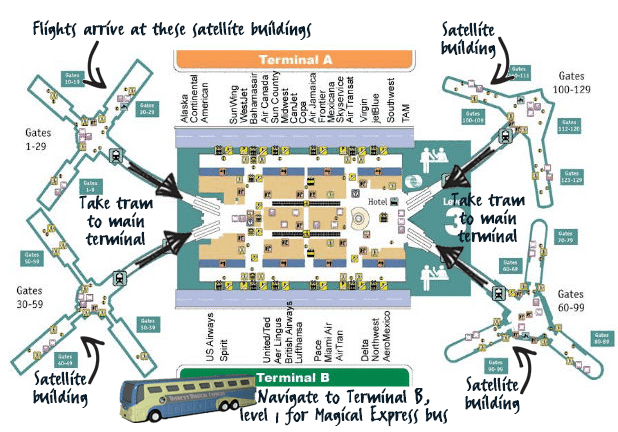 Find the Magical Express area at the airport. Once you arrive at Orlando International Airport, you will navigate to level 1 of Terminal B to get on a bus (stop by your baggage claim first if you want to retrieve your own bags). Before going down any escalators, check to see which side you are on. Once you're on the B side of the terminal, then you can go down the escalators. Look at the graphic below to see which airlines arrive on the A side and which are on the B side. Get in your resort's line. You will need your MagicBands or vouchers to check in. You will then be directed to the line that corresponds to your resort and you'll board your bus when instructed. You will likely wait at least a little bit before the bus departs (up to 30-40 minutes), which will include both some time waiting in line and time waiting on the bus. Take a bus ride. 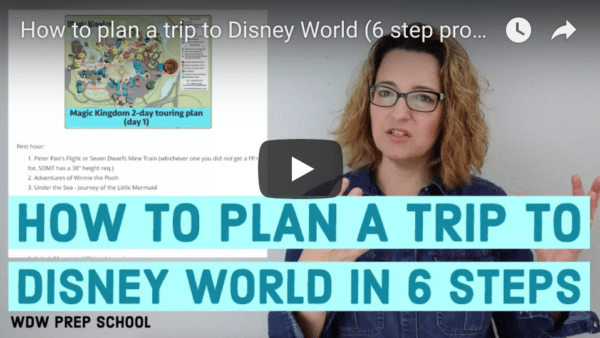 Once the bus departs, a video will play on the screens with Disney World info (this video annoys some people, but it helps you get excited about your trip). After about 25-35 minutes or so, your bus will arrive at Disney World. Each bus stops at a few resorts so you could end up stopping a couple of times before arriving at your resort. You should plan on budgeting up to 90-120 minutes from the moment you enter the line to the time you are dropped off at your resort. Unload and tip. If you brought your bags on the bus, they'll be unloaded from the storage compartment. Tips are appropriate for anybody who has helped to handle your bags at the rate of $1/bag. Cast Members will not ask for tips, but there is a sign on each bus saying that tips are accepted. For more information, checkout guide on when to tip at Disney World. Wait for checked bags to arrive. If you used the Magical Express luggage tags for your checked bags, those bags will be picked up and delivered to your resort room, but this process could take up to 4 hours or so. Be sure you have things with you that you'll need while you wait for your luggage to arrive. Tipping is not required or even really possible with the people handling your checked bags because you will likely never see or interact with them. Find out pick-up time. The day before you're scheduled to depart, you'll receive a note in your room telling you what time you'll be picked up to go back to the airport. The pick-up time is usually about 3 hours before (sometimes 4) your flight departs for domestic flights and 4 hours for international flights. DO NOT MISS YOUR BUS. You may not be able to use Magical Express if you miss the one you were supposed to take. Flight check in at resort (if applicable). Guests flying on certain airlines have the option to get boarding passes and check their bags for their flights at their resort using Resort Airline Check-In. Use luggage bell services. Guests who don't want to check bags at the resort can carry them on the bus on their own. If your flight departs later in the day and you want to spend time in the parks, you can use luggage bell services in front of your resort to hold your luggage until you're ready to go. Leave yourself a bit of time to pick up your luggage before Magical Express arrives to take you to the airport. Can I take my child's car seat on the bus? If you have a car seat, it can be stowed under the bus with the other luggage, but it can't be used on the bus seats. What if I want to only take a bus 1 way and not round trip? Can I take Magical Express to/from Disney World at a different time than when my flight is scheduled? Yes, you can do that by either inputting other flight times when you make your ME reservation, or you can call them at 866-599-0951 to let them know what times you prefer. This is especially handy if you arrive late, want to stay at a hotel at the airport, and then take a bus to Disney World the next day. What if I only want to have my luggage picked up at the airport and delivered to my resort but I don't want to ride a Magical Express bus? Sorry, that's not allowed. Many people would like to have their luggage transported to their resort and then head straight to the parks in a rental car or taxi. If that's your goal, I would suggest making a quick stop by car/taxi at your resort and leaving your luggage with luggage bell services right at the front of the resort and then hopping back in your car/taxi to go to the park. What if different parts of our group are arriving/leaving at different times? They will be able to accommodate you. Make sure each name is on the room reservation and then give Magical Express the flight information for each person. I'm flying into an airport other than Orlando International Airport. Can I still use Magical Express? No, you won't be able to. What if I'm from another country and want my luggage picked up and delivered to the resort? If Orlando is your first entry in the U.S., you'll need to claim your bags and clear customs. You will then give your luggage back to the airport officials where you can either pick it up at baggage claim or have Disney get it for you. Once you arrive at the Magical Express area, let them know you'd like them to get your bags and they will. If Orlando is not your first entry into the U.S., you can proceed just as domestic guests do - get your bags from baggage claim and take them to Magical Express, or you can just go straight to Magical Express and let them know you want them to get your bags. There are definitely times when it makes sense and other times when it doesn't. Check out this comparison of airport pickup options to see what other choices you have. Have other questions or info to share? Please feel free to share in the comments. If my flight arrives at MCO at 7:30 am and I am staying at All Star Movies, but I want to go to the park as soon as I arrive, how do i do that? Do I have to check into the hotel first and then take a bus to the park? What about handicap scooters? Can we bring them aboard? What about a courtesy checked stroller. If we put the checked bag tag on that will it be delivered to the resort as well or would it be better to just wait around and get once it comes off the plane? If we arrive in Orlando around 4:30 am, does that mean we cannot have our luggage transported to our hotel? Or do we pick up our own luggage and then get on the Magical Express bus? This article needs a subsection for determining whether or not to use the luggage component of this service. It really is it’s own decision point and it confuses many people. We have a plane transfer on the way to Orlando: we’re a little nervous about sending our things with ME tags. What are the chances they don’t make it to the next plane? Chance will be the same with or without the tags. 🙂 As long as the layover isn’t super quick, they usually make it on the next plane. If they don’t, they’ll be put on the next plane and ME can pick them up then. We are flying into Orlando airport but on Frontier Airlines. They weren’t listed as one of the airlines. We have received luggage tags. Do we have to get our own luggage? The airlines listed here are for people who want to use airline luggage check-in at the resort for the trip home. Since you’re not flying on one of the participating airlines, you’ll just need to carry your bags on the bus back to the airport. Thank you Looking forward to our stay at Disney with our granddaughter for the first time! Thank you for all this helpful info., I love your site!! Do I need to link anything from my voucher for the ME to my Majic Bands in order for me to board the bus without the voucher? Hi, Frana – you’ll be able to use your MagicBand to board the bus from airport to hotel, but you’ll need the voucher they leave on your door to board the bus back. Enjoy your trip! I know magical express requires a Disney reservation. We are a party of 6 all on a resort reservation – but we are traveling with an extra small child. She is only 3. She is staying with her mother once we arrive but has tickets to the park, etc. I know technically she isn’t supposed to be allowed on ME but will they let her on, especially considering one in our group is a lap seating infant? Can we buy a pass for her? I have heard you could go to the mears desk and buy something. Obviously since she is 3 she cannot ride anything by herself. And our room is at max so we can’t add her to our reservation. We have use Magical Express previously, and loved it. We will be renting a van at the airport this time around. You touch on not being able just to have your luggage delivered without riding the bus to the resorts, but what about on the return flight home? Are you able to bypass bag check at the airport still, and check your bags at the resort, even if you don’t ride the bus to the airport (as we would be returning our rental car)? You can definitely use resort airline check in for the trip home, even if you don’t ride Magical Express. Check out the link to the resort airline check-in info in the article above. Thanks for the great info Shannon! If we use Magical Express luggage tags for our checked bags and they are delivered to our room, do we have to be at the resort to receive them? Or can we be out and about and get them once we return to the resort? You don’t have to be there! That’s one of the best parts. They’ll bring the bags to your room and leave them whether you’re there or not. That _is_ a great feature. The bags “magically” appear in our room while we’re away. Magical express is sounding like a great option for us. We are staying at AoA. Which resorts are typically the first the first stops. Hi I’m all booked for the magical express for my arrival to Florida but I haven’t booked a return flight yet. Can I still book the magical express when in Disney? Hi we are flying in from different states at different arrival times. Can I enter different addresses and flight info for members of our party? Thanks! Can we use Magical Express the day of our reservation even if our flight arrives the day before? We were thinking of arriving in FL the day before our reservation, spend the night at an airport hotel, and grab the bus first thing in the morning. Is that possible? Check flights for the following day, enter that as your arrival information and shuttle back to the airport at the time you want to leave the airport. You’ll have to keep your bags with you, but everything else will be fine I suspect. We are using ME to get to our resort. However, when we check out, we plan on staying a couple more days in Orlando before flying home. I would like to take ME to the airport the day we check out so I can rent a car from there. (I want to use Hertz which isn’t available at the Disney Car Care center) is this possible? What if your flight is late? Will there be another bus coming along to get you later? Also- I want to pick up my own bag and bring it to the bus…will there be time to get my bag and still get to the correct bus? I don’t want to miss my ride and have no way to WDW! I would use only the return ME service, but my flight is around 11 pm on the day of check-out. I know the ME leaves the resort about 4 hours before, but can I leave the bags at the resort until that time and stay in the premisses, using resort amenities after checking-out? Any suggestions for late evening arrivals? We are scheduled to land at 9:00 PM on a Wednesday evening. We’re debating about the bag delivery. Will we get to the room any quicker if we skip baggage claim and get directly on a bus? I suppose it depends on how frequently the buses leave. However, I don’t want someone knocking on our door at 1:00 AM delivering our bags, or could they be held at the desk until the morning? I am flying into orlando and renting a car for the weekend but then going to disney the following week. 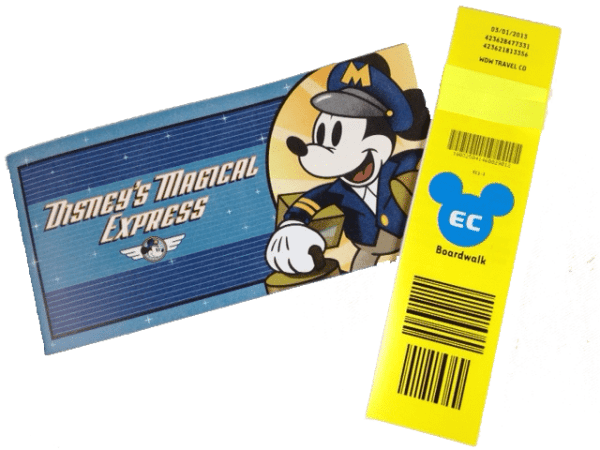 Can i return my rental car at airport and use my magical express voucher to get to my disney resort? We’re arriving at MCO at 11am and then taking the ME to the Polynesian. If our flight were actually on time, about how long will it take to get to the resort then head over to Disney Studios? I’m trying to make sure our Fast Pass times for the day make sense. Thank you! I would allow at least 4 hours or so to be safe. Hello. We are planning a trip to disney in 2017. I have booked my disney trip package but waiting on flight prices. I already know the flights i want to choose can i give that information to disney or does my flight have to be booked in order to give them that information? Do they still use vouchers to get on the Magical Express? I didn’t receive them, and I think they just use your magic bands now. They mail you vouchers and you can use your MagicBands. Either will work. Hi! We have a Dsiney trip coming up real soon. May have to change 2 of our guests to an earlier then originally thought flight. Like a 6:20 am flight. Will ME be able to pick them up and get them to the airport in time for a 6:20 flight. They will not have checked bags. ME runs 24/7. The only thing on a more reduced schedule is luggage handling which won’t be an issue if they don’t have checked bags. Hi! This is tripping me up- we arrive MCO on a Sat 8:20pm. Pop reservation is for Sunday. Can we take DME to Pop and then get an Uber to Universal to spend Sat night? Then Uber back to WDW? Unfortunately you can only use the Magical Express for the dates on your Disney resort reservation. Since you aren’t checking in until Sunday, you will have to arrange other transportation to your hotel at Universal. But you will be able to take the ME back to the airport if you are checking out of Pop Century the day you fly home! Wondering if it is possible to use the magical express to go BACK to the airport on a different day then check out. For example, we are considering staying on property for a few days and then staying off property for a few days, would I still be able to use magical express to get back to the airport if it was not on my disney check out date? Good question, but that won’t be possible. They don’t know what flight you’re arriving on, but they know when you’re leaving so that’s the day you have to use Magical Express. Hi. My husband and I are traveling to Disney World at the end of August. We are arriving at MCO around 7pm on a Thursday, but our hotel reservation at Disney isn’t until Friday. Since we are getting in late, we plan to stay at an airport hotel then head to Disney Friday morning. Will the Magical Express allow us to take an AM bus even though we arrived the previous night? Yep! Just use a flight number for Friday morning and then board Magical Express then. If we brought a back pack, can we take it on the magical express? Can we bring our bags to the hotel? Hello, We are going to Disney Monday but never recieved our luggage tags. So that must mean we need to retrieve our luggage from luggage claim and bring to the magic bus area? And do you know if the hotel will take my carry on if my room isnt ready and we want to go straight to magic kingdom? We are arriving in Orlando on Monday Oct 31st at 9:30 am…we have a chef mickey brunch adr at 12:55. Do you think this is enough time to hop on the magical express, arrive at the Polynesian (the resort we are staying at) and then hop on the monorail to the Contemporary for brunch? 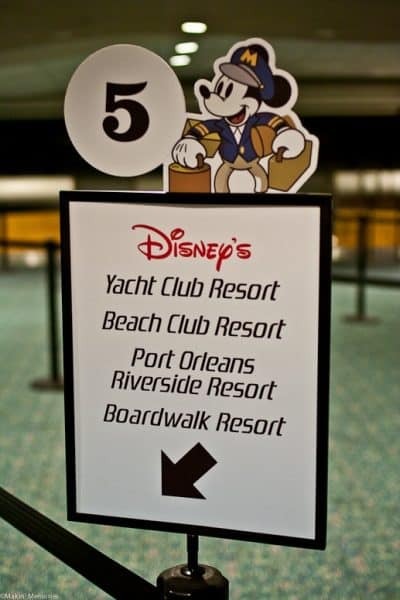 Especially because the poly and contemporary are right on the monorail line you should be good to go! Thank you for all of the great information. So we are planning a trip and staying on site Wed-Saturday and going to the park on Saturday as well. Our flight leaves MCO Sunday morning at 6 am. This would mean we would have to get up at 2 am abd board ME at 3 am for the flight. We don’t really want to pay for a room Saturday night and would rather go to Disney Springs until midnight or something and then catch the ME. Can we still schedule the ME for Sunday morning even though we are not staying there that night or should we find a flight number for before that and have the ME pick us up early? Would it need to be before midnight? What would you suggest? thanks! You would have to take it back to the airport on your checkout day. If that doesn’t work for you, I’d suggest taking an Uber from Disney Springs to the airport. They will often offer to have you pick up new items in the gift shop. Speak to a Cast Member and see if they can help you out with that. We are looking to go to WDW (for the 1st time) in October of this year, traveling with a 5 & 8 yr old. 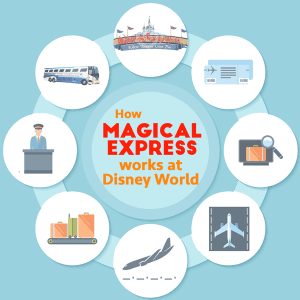 IF we book our flight separately from the WDW vacation planning site (but book our resort, dining plan and tickets thru them), can we still utilize the Magical Express? We are on a fairly tight budget and are hoping we can get a much less expensive southwest fight on our own. Would still like to be able to use this free transportation service if possible! Any info you can provide would be much appreciated! So long as you are staying at a Disney World resort (not including the Swan, Dolphin or Shades of Green) it is fine. On our last trip we flew Southwest and had a great time. Disney will mail you yellow stickers to attach to your luggage, so when you check them at the airport, they will be sent to your room (you don’t have to get them from luggage claim). Please note, it may take a few hours for your luggage to make it to your room, so we pack whatever we need for the first day in our carry on (sunscreen, hats, magicband). That way you can go visit a park as soon as possible and bags will be waiting in your room when you get back. Also, if you are taking a stroller, Southwest will gate check it for free. Just ask at the gate counter and they will tell you what to do. come up with out of curiosity…no good deals even though a sale was currently going on and I had my eye on tbe flight I intended to book. When I called Disney to make my reservation, the woman helping asked if I needed help with travel & I told her we would be flying but hadn’t booked it. She asked if I wanted her to grab that info into their system and I said sure. She said she could book it for me at the low fare I wanted! Awesome! One call, one charge and my entire trip was handled. You mentioned that you could only check one bag at the resort. Is this one bag per ticketed passenger? Or one bag per family? I love that you cover every aspect of the Disney WDW experience! If I have my significant other meeting me at my hotel later, but he didn’t book his package like mine, can he still use Magical Express? He will be buying tickets and paying for meals on his own but staying in my room. I plan on using the ME for my arrival to Polynesian (no checked bags) on May 2nd. Can I take the ME back to the airport if I”m staying at an airport hotel the night prior to morning flight? (Ie take ME back to the airport tuesday night for a wenesday flight? Hi Shannon, love love LOVE your blog and podcast! We are leaving for our FIRST in just two short weeks. We fly into Orlando at 9:25, and have a Be Our Guest lunch reservation at 12:20. We are already planning on taking a taxi, but truly in your opinion is that way faster? Wanted to share something I learned on our last visit. We always fly in and use magical express. It is a wonderful service. I love that once I check my bags in at our local airport, I do not need to worry with them again until I return home. On our trip last year however, I had a different experience. I tried to avoid lay overs and booked a different flight service than the one we used to fly in. Because of this, I could not check my bags at the resort for our return flight. I had to take them from the bus, rent a trolley, and check our bags in at the airport. I know this does not seem to be a big deal but when it is just me and my two children, it does become a huge inconvenience. Plus, the baggage check in experience was not a positive one at MCO. Regardless of lay over, I will use the same air service round trip from this point forward. I greatly appreciate Disney’s Magical Express service. It is so helpful and really starts and ends your vacation in such a positive, no stressful way! Can you get off the disney magical express at a resort other than the one you’re staying in? We’re checking one bag each and won’t have any carry-on luggage other than the small bag I’ll be taking into the parks. Would we be able to get in line for a resort that’s closer to the park we want to go to? I am wondering the same thing. We are staying at Fort Wilderness but are having lunch just after we arrive at the Contemporary – Chef Mickey’s. Our flight arrives at 9:55 and our reservations are at 11:35. Can we get off at the Contemporary and still expect our luggage to make it to our resort room at FW? Second thought/question… We were thinking of renting a car but will need two car seats. I was wondering if I could ship our car seats to the Contemporary, have my husband get our rental car at the terminal and then meet us (riding on the ME) at the Contemporary where we could install the seats after breakfast… will this work out? Can we ship to the Contemporary if we aren’t staying there? My son and his wife wanted to go to a different resort than the one we were staying at so we could eat together. At first they were told no, but then the people let them since there were not any lines. The downside was their magic bands were not activated since they had not gone to their resorts. I was able to deduct the meals from my band (since I arrived the day before and my band was activated), then they did my meals the next day. Lesson is: you might be able to go to another resort, but if you need tickets or meal plan from your magic band, it will not work until you check in at your home resort. Hope that helps. Hi Shannon! I am signed up to take ME to and from our resort in March. I was thinking about renting a car to take us from the airport to the resort (for a grocery stop) and using ME at the end of our trip to take us back to the airport. Will ME still deliver our bags to our resort even if we don’t ride? I’m flying with southwest and need to check in online 24 hours in advance to get an earlier boarding group (no assigned seats, first to check in = first to board). Disney checks you in 12 hours before. Will I mess anything up by checking myself in 24 hours before? I recommend always paying for Early Bird Checkin on Southwest which will allow Southwest to automatically check you in and get you an earlier boarding group. Only way to make sure your group gets to sit together. However, you can check yourself in 24 hours ahead of time and then when Disney prints out boarding passes, they’ll print out with whichever boarding position you got when you checked in. They won’t check you in if you’ve already done it. I’m traveling with some friends from another city (I’m in Pittsburgh, they are in Cleveland). I called to make my ME arrangements because our flights are getting in at different times and was told that my ME tags will have to be mailed to my friend whose address is on the hotel reservation (we don’t have a vaca package – just the hotel reservation). My Magic Bands are being sent to her as well. Just wanted to give others that heads up! Hi Shannon, i will travel to Miami first for a few days and then to Orlando. I will take the redcoach transportation from Miami to Orlando Airport. Can i take the Magical express if i don’t arrive to the airport by plane but i have my disney resort reservation? Yes. When you book Magical Express to go from Orlando airport to WDW, just use the flight # of a flight that’s arriving that day. Disney doesn’t check those – they just need to know when to expect you. That will allow you to use Magical Express. We leave for WDW in 23 days & plan on using the Magical Express with the option of picking up & transferring our own luggage on the way to the hotel. On our last day there, we want to spend at Magic Kingdom and our flight leaves at 9:50PM. Since checkout is around 11AM, can we leave our luggage with Disney All Star Sports Resort & let the Magical Express transfer it to the airport? We will be riding the ME to the airport from the hotel. I’m trying to pick out our flights for November. If we get an early flight in, say arrival of 8 am, is there a way to send along our carry on bags so we can go straight to a park? Or do we have to take them with us until check in time? Thanks for the information! We are heading to Disney for our first trip in March. It is a complete surprise for our daughter and we want to make it extra special so we are thinking about getting a limo 🙂 Which limo service do you recommend? Thanks for this info it was very helpful! I was wondering if you know what to do if you book with the Magical Express too late and there is not enough time to receive the vouchers and luggage tags in the mail. I am assuming I will need to stop at their welcome desk, but will I need ID or a confirmation number or something? Your MagicBand can be used to check in or you can stop by the desk. If you want them to transport your luggage, you should label it somehow so it stands out. If you want to transport it yourself, just go claim it at the baggage claim and then head to the Magical Express check-in area. We signed up for Magical Express and our in laws surprised us by renting a car at the Orlando airport. So, we didn’t ride the ME bus, but our luggage arrived at our room anyway. ME for luggage only works just fine, you just can’t order a “luggage service only” ME. Also, if you can’t arrange an early flight in, you can try arriving the night before your trip starts and stay at an airport hotel with a shuttle service. Then sign up for ME using an early flight’s info for the next morning. Take your hotel’s shuttle back to the airport bright and early then hop on an early ME bus. (If you do this you will need to manage your own luggage though on you arrival ). This is a great way to get that first full day of magic! Happy a travels! Do you know the order in which the ME stops at each resort? My daughter and I have planned a 4 day Disney trip and would like to make the most of every minute. We’re staying at the Boardwalk Inn and would consider taking a taxi if the ME makes more than 2 resort stops before stopping at the Boardwalk. We land at 9:30am and our goal is to be walking into Hollywood Studios at noon, including our check in time! Wasn’t the Magical Express originally only a temporary thing? We’ve used it several times and had no problems whatsoever, so glad that Disney has decided to keep it going. This post was fabulous! As we are approaching our fall trip, I’ve had many questions and concerns about using Magical Express. Thank you for the indepth information on getting to and from your hotel at Disney via Magical Express! You are the best Disney World information website out there! Thanks for all of your help! Thanks, Cameron! Glad you find the site helpful. When planning our upcoming trip, I found that we could use ME and a grocery delivery service for less than renting a car for the week. And no messing with bags! I also hated the idea of taking 3 kids (and a husband) on a plane and then to the grocery store! Taking about killing the Disney excitement! HI SHANNON, I love your site. How much is it to rent a limo from the airport to wdw resort? It’s about $225 roundtrip. They will make a grocery stop between the airport and WDW for 15 minutes if you request it. There definitely is buses just like the Magical Express buses that transport cruise guests. Be sure to contact Disney because I’m sure they can help you figure that out. Just wanted to let you know that I did notice during our April 2013 WDW adventure that our ME did indeed have seatbelts! Not sure all buses do at this point but ours did. The use of the belts was voluntary and was not even mentioned during the “whose getting off where?” speech that the driver makes:) Anyway, thought I’d pass that along because even though no other mass WDW transportation has safety belts I did like the idea that my 3 and 6 year-olds had the option. we used Magical Express on our trip at the end of May/Early June & it was phenomenal. Not much longer of a wait to leave the airport than if you were going to wait for a taxi, get a rental car, etc. Plus, when we arrived @12 noon to AoA, our room was ready, and by the time we cam back from grabbing lunch, our bags arrived (and our 5th, non-ME tagged bag came 30 minutes later). Off the parks we went, without having to worry if our bags were really going to arrive, lol!! Also loved not having to deal with our luggage at all until we arrived back at home! No downside at all for us! Love hearing about all of these great experiences. Sounds like it worked as advertised for you. I love you for posting this information. I have used magical express many times so I know how it works…. but on our next trip, my MIL is going to be meeting us and will be using magical express for the first time. (we live in different parts of the country) I can give her this information and know that she’ll understand how it works. Lets be honest, I could NEVER do such a great job at explaining. I actually started this website because I was helping my brother-in-law and sister-in-law plan their trip and I had nowhere to send them to get the basic info so I created it myself. Glad it’s helpful for your MIL as well. I love Magical Express. My partner and I are making our third trip to WDW this fall and have taken the DME each time. We love being in the “Disney bubble”, though, and don’t need/want to spend money on a rental car, so it’s perfect for us. Watching the video on the way to our resort is always such a good “we’re in Disney World” moment. One big advantage for us is having our luggage delivered to our room. However, the last time we went to WDW, though, we landed after the 10pm mark, so we had to get our own luggage. It was only a moderate pain, though, and no different then traveling anywhere else. Glad to hear it worked out for you! We used Magical Express when it was brand new in 2005 and it had more hiccups in the process than it does now. It seems to work pretty smoothly for most people. This definitely helped me book our first walt disney world on-site stay. We are staying at All Star Sports, and using Magical Express for the last weekend in October. We usually stay off-site with 2 nights on-site, but this time we are taking the plunge into a full bubble of Disney magic. I hope the Magical Express experience runs smoothly. “…full bubble of Disney magic.” Love that! That’s Disney’s goal for sure. Do the buses just keep running continuously like the disney park transportation? We would like to stop and eat at the airport but don’t want to miss the bus. They do run continuously. You’ll be fine to get a bite to eat before getting on the bus. I was wondering if we check in and our room is ready before the bags arrive-will they be delivered to our room or do we have to pick them up at the desk? If we have to pick them up-does the resort notify you when they are there? The bags will be delivered to your room. Super convenient. We just got back from Disney a week a go and we used Magical Expresd. We found it to be wonderful. We didn’t need to worry about our bags or securing transportation and it was run really well. Great service if you do not need a vehicle! This is a very informative read for me. I always wondered how this system works. I can see how it makes sense for some folks. My family likes to rent a car and travel from the airport as quickly as possible so that probably would not work for us. I wonder how folks with younger children feel about this program? Many people with younger kids love it because it requires them to carry less. My only issue is the wait at the airport which can be a total buzz kill for a toddler that’s just spent hours on a plane and is now being required to sit on a bus. We’ve been using ME since Madison was 3. We have a little tradition, always stop at the McDonalds at the airport for lunch then ride the bus. Gives her time to stretch her legs and a little break! That’s a good idea and a great way to break up the long plane ride and the bus ride.